By teaming up, that is. In June, the U.S. Navy released a budget allocating $264.9 million towards upgrading its roughly six hundred FA-18E and F Super Hornet and EA-18G Growler fighters to the new Block III standard, which includes some of the enhancements proposed for the Advanced Super Hornet. This is intended to coincide with a service-life extension program (SLEP) meant to increase the type’s flight hours from six thousand to nine thousand. 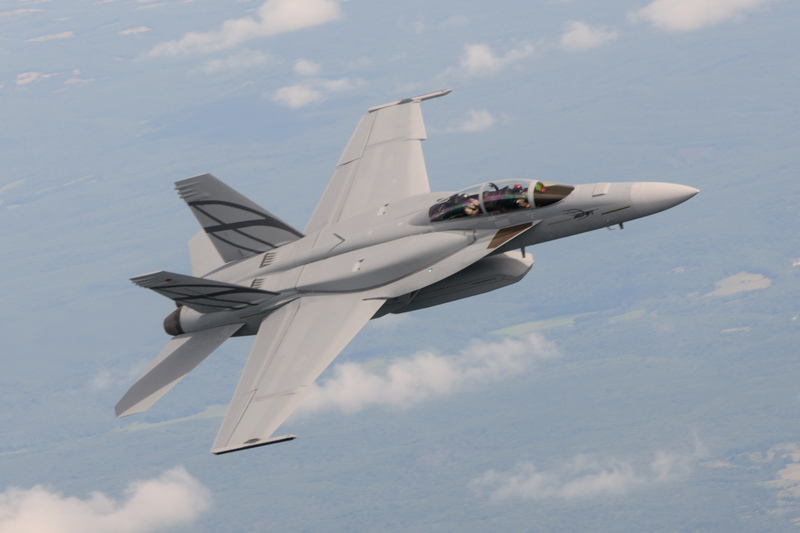 The first of the upgraded aircraft are expected to enter service in 2019, and the Pentagon is now talking about keeping its Super Hornet fleet active through 2046. A few days later, the Navy also announced plans to purchase an additional eighty Super Hornets over the next five years for $7.1 billion. All in all, it would seem that Boeing has successfully redirected defense dollars away from the expensive new F-35 stealth fighter by emphasizing the lower price of maintaining the Super Hornet fleet. However, it would be mistaken to say the Super Hornet proved it could replace the F-35. In fact, the Block III upgrade should help the Super Hornet team up with the stealthier Lightning when taking on tougher opponents. The single seat F/A-18E and two-seat F/A-18F are larger, higher-performing evolutions of the 1980s-era F/A-18 Hornet attack plane. Though comparable in many respects to such excellent fourth-generation fighters as the F-15 Eagle, the Super Hornet has a lower maximum speed and is slightly less agile due to the engineering compromises necessary for taking off and landing on Navy carrier’s. On the plus side, the Super Hornet does come with more modern avionics and a unique advantage baked into its airframe: a reduced radar cross section estimated to be around one square meter from the front, a fraction of that of an F-15 and one of the lowest on any fourth-generation jet fighter. However, that’s still too conspicuous to be a proper stealth fighter. At best, the Super Hornet’s stealth advantage will modestly decrease the range at which it can be detected and tracked by powerful modern radars. Thus the Pentagon’s push to adopt the F-35 Lightning, which has a radar cross section of around .001 square meters—potentially three orders of magnitude smaller than the Super Hornet’s. With a genuine stealth fighter like the F-35, U.S. pilots could pick off enemy fighters and air defenses radars from long range with little risk of detection and retaliation—or, at least, so the theory goes. Supposedly, this strategy has been borne out by the lopsided 15:1 kill ratios or better in recent Red Flag exercises pitting the F-35 against non-stealth aircraft. However, the F-35 program’s spiraling costs, technical problems and delays have reached nearly legendary proportions—at a projected lifetime cost of around $1.5 trillion, making it literally the most expensive weapon program ever. The F-35’s flight characteristics have also been a source of criticism. President Trump unusually used his presidential podium to attack the F-35 and boost the idea of replacing it with cheaper upgraded Super Hornets. Now the U.S. Navy plans on operating a mixed force of two squadrons of F-35Bs and two of F/A-18s on each carrier, though initially that ratio will be weighted at three to one towards the Super Hornet. The fourth-generation fighter remains vulnerable to a full range of increasingly sophisticated air- and ground-launched antiaircraft missiles when compared to the F-35. However, the Navy has a strategy to cope with this deficit: F-35 stealth fighters could “ride point,” safely flying deeper into enemy radar range while using their advanced sensors to gather data on enemy aircraft and air defenses. Then they could relay this data to Super Hornets waiting in the “back field.” With their radars already cued to quickly acquire their targets, the Super Hornets could maneuver to an advantageous attack position and dart within firing range to lob their long-range missiles from a distance at which their own weaker stealth features might still be somewhat effective. All of the Block III upgrades basically make this strategy easier to pull off—particularly those made to the Super Hornet’s avionics. While the Super Hornet already comes with a datalink, new Tactical Targeting Network Technology allows it to share vast amounts of data at very high speeds with friendly aircraft and ships—up to ten times the computing power currently onboard the EA-18. Furthermore, the system enable the Super Hornet to become a contributor, not just a consumer, of such data, which may have useful applications when combined with the Super Hornet’s new Infrared Red Search and Track sensor. Another system, the Distributed Targeting Processor Network, allows the Super Hornet’s computer to compare sensor images it receives with a geo-registered database to deliver precise long-range strikes against ground targets—which might help it deal with air defenses from a safer distance. To help pilots cope with information overload, the cockpit is also a receiving a new Elbit ten-by-nineteen-inch touchscreen flight display, replacing several smaller monitors in one go. The most expensive part of the Block III upgrade pays for a Conformal Fuel Tank (CFT), which addresses the Super Hornet’s troublesome short range on internal fuel. Indeed, the Hornet’s limited combat radius of four hundred to five hundred miles on just internal fuel puts carriers at risk by forcing them to sail closer to hostile shores bristling with new ship-killing weapons. Currently, Super Hornets rely on up to three drop tanks—two underwing, and one under the fuselage—to extend their striking range, as well as aerial refueling by by Super Hornet tankers. However, drop tanks enlarge the Hornet’s radar cross section; cause additional drag, degrading flight performance; and occupy hardpoints that could be carrying weapons. A conformal tank, on the other hand, is bolted on to “hug” the fuselage at minimal cost to aerodynamics and radar cross section, giving the upper fuselage a “hulked out” appearance. The Super Hornet’s CFT weighs only 870 pounds empty and can carry up to 3,500 pounds of fuel, extending the combat radius by 130 nautical miles to around 690 (800 miles)—which just so happens to put it closer to the combat radius of an F-35 using only internal fuel. The CFT reportedly creates no additional drag at low speeds, and only minor amounts approaching supersonic or higher. Furthermore, it even slightly reduces the Super Hornet’s radar cross section, and when fitted to the EA-18 Growler electronic attack plane, causes less obstruction to its ALQ-99 or Next Generation Jammer jamming pods than underwing tanks would. The CFT upgraded seems especially pitched to preserving the F-18’s stealth characteristics. Indeed, Boeing has claimed a “50-percent improvement” to frontal aspect stealth while using the new tank. However, this statement also presupposed the use of another technology offered by Boeing that is not in the Block III upgrade, the Enclosed Weapon Pod. Underwing weapons are decidedly conspicuous on radar, so the pods could conceal up to 2,500 pounds of bombs or missiles in a stealthy fuselage-mounted container. However, the Navy may be skeptical that there is enough benefit to be gained in improving the stealthiness of a non-stealth airplane. Still, some sources suggest that the Block III upgrade may include applying coatings of radar-absorbent materials to the more reflective surfaces of the Super Hornet. Another proposed upgrade the Navy has passed on for now would involve installing improved F414-400 turbofan engines. These would reduce fuel consumption by 3 to 5 percent, generate up to 20 percent more thrust and operate two thousand additional flight hours before requiring an overhaul. Boeing claims the expensive upgrade would pay for itself by saving $5 billion in fuel and maintenance costs over subsequent decades. On the other hand, the Super Hornet has already begun receiving new Infrared Search and Track 21 (IRST) sensors. An IRST system is a discreet alternative means of detecting adversaries, though earlier IRST systems had very limited range compared to radar. However, newer IRSTs on aircraft such as the Su-35 can track targets up to fifty miles away or farther. Infrared sensors still have a shorter detection range than the powerful and low-observable AESA radars aboard U.S. fighters, but they could be extremely useful for detecting hostile stealth fighters and for operations while under heavy jamming. Super Hornets will now able to network their IRST sensors with friendly aircraft and “fuse” infrared sensor data into the overall picture—potentially allowing fighters to stalk opponents with their radars off, minimizing their own detection range while relying on the IRST to home in for the killing blow.